Buy the Jazz Jumpsuit and Dress sewing pattern from Ready to Sew. Jazz is a loose and comfortable jumpsuit/dress. It has front side pockets, a v-neck and a slightly gathered waist. It can be worn boxy or with the waist belted. You can sew six versions, mixing two types of bodice and three types of bottom. Sleeveless: The armhole is loose under the armpit and slightly covers the shoulder. With sleeves: The slightly dropped sleeve is gathered at the bottom for a bishop sleeve effect. Suggested fabrics: Wovens. Jumpsuit: Mid-weight polyester or wool crepe, rayon and linen blends, Tencel, viscose. Choose a heavy and supple fabric, a little weighty (avoid rigid fabric). Playsuit: Mid- or lightweight viscose, Tencel, crepe, rayon and linen blends. Choose a fluid, light and supple fabric (avoid rigid fabric). Dress: Jumpsuit and playsuit fabric and also double cotton gauze. Fabric requirements: 140 cm wide fabric: sleeveless playsuit, 160 cm; sleeveless jumpsuit, 240 cm; playsuit with sleeves, 195 cm; jumpsuit with sleeves, 270 cm; sleeveless dress, 203 cm; dress with sleeves, 265 cm. Sizing: EU 32 – 46 (approx. UK 4 – 18). Please check the size chart. Note: Sizes EU 48 – 52 are NOT included in this pattern, even though they appear on the size chart. This sewing pattern is available in PDF format. The PDF of the pattern will be available immediately for download after purchase. PDF pattern includes: Instruction booklet, A0 file, A4 file. An Expansion Pack is also available for the Jazz Jumpsuit and Dress. The Expansion Pack allows you to create 30 Jazz variations. It includes pieces to make a jumpsuit or dress with a front button closure that stops at the waist; a coverall with a front button closure that stops at the hip; and a peplum top. There are two sleeve options and a sleeveless option for all variations. PLEASE NOTE: The Expansion Pack is not a complete pattern. You must buy the original Jazz Jumpsuit and Dress PDF priced at £10.00 to use the Expansion Pack. Jazz Jumpsuit X Breezy Days 💙 let’s file this one under “things I’ve been meaning to make for AGES and I’m so happy I finally have”. 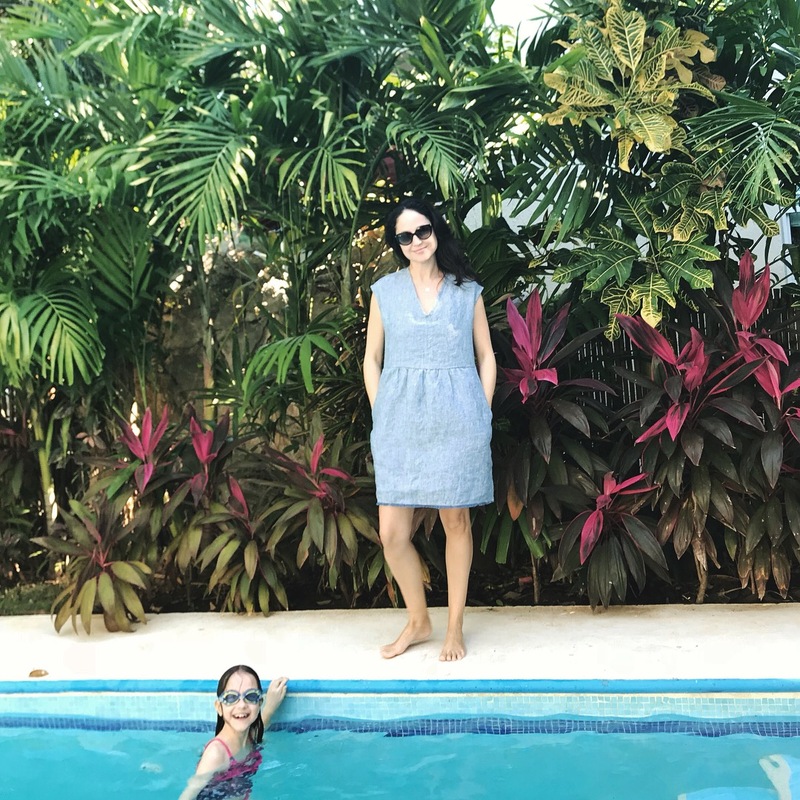 I used a floaty rayon and it’s just perfect for this floaty style! Mods: I added belt loops at the side seams ((basically just a thin fabric tube cut to size) and took inspiration (and instruction!) from the latest Seamwork jumpsuit and finished the back zipper lower in the CB seam and added a keyhole with button closure! I have made the dress and jumpsuit now from this pattern and seriously love them both- the drafting of the bodice gives such a lovely shape. 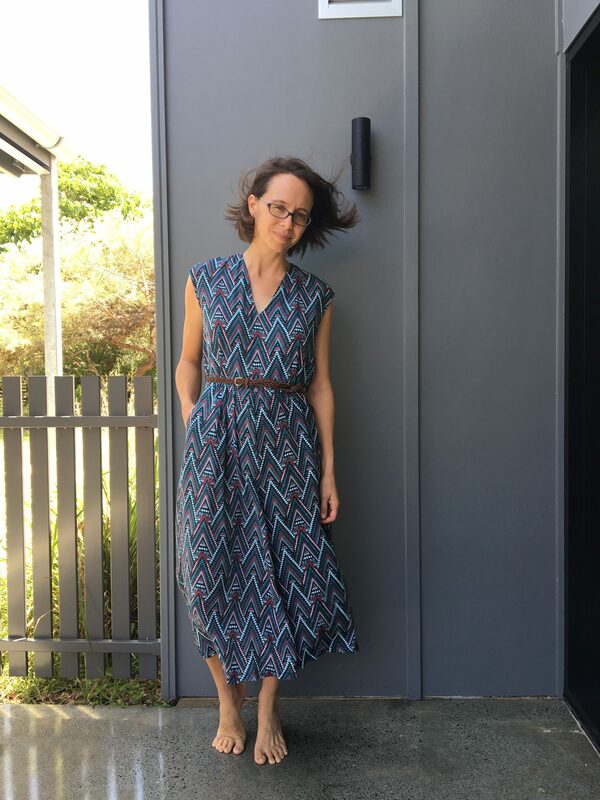 I made version 6 which is the dress with long sleeves using a viscose and followed the pattern exactly apart from lengthening the skirt to make it below the knee. This is an excellent pattern and goes together well with good instructions. I stay stitched my neckline so it would keep its shape although this wasn’t mentioned in the instructions. I love the sleeves on the Jazz dress and have received many compliments when I wear it. Would definitely recommend! This was a fun pattern to make. I chose a linen cotton blend, and it does breathe nicely. The instructions were great, and it sewed up quite quickly— although I think the sizing is on the generous size. I ended up taking it in a big, and sizing down. Definitely a great pattern! I had the pleasure of testing Jazz, a relaxed and stylish pattern with 6 different bodice and bottom combinations. I went for view 1, a combination of the culotte bottom and sleeveless v neck bodice and made it up in a lightweight printed cotton. 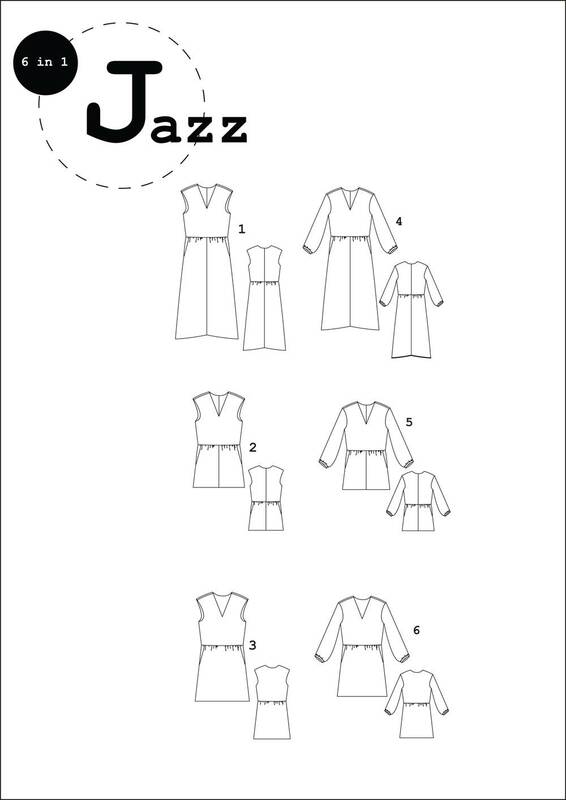 Jazz is a pretty hefty PDF pattern, though if you’re decisive about which version you want to make, you can be savvy with your printing and save on paper. Another great paper and time saving trick is to try printed option B. The pattern lines run right up to the edge of the paper, with just the slightest gap at the margins of the page, meaning no trimming before taping pages together. The pattern is also layered meaning you can select your size. As with the other Ready to Sew patterns I’ve made the prep includes overlocking all raw edges that need it prior to sewing. The construction is simple and the instructions are easy to follow, with click through tutorials on the PDF for some of the trickier techniques. 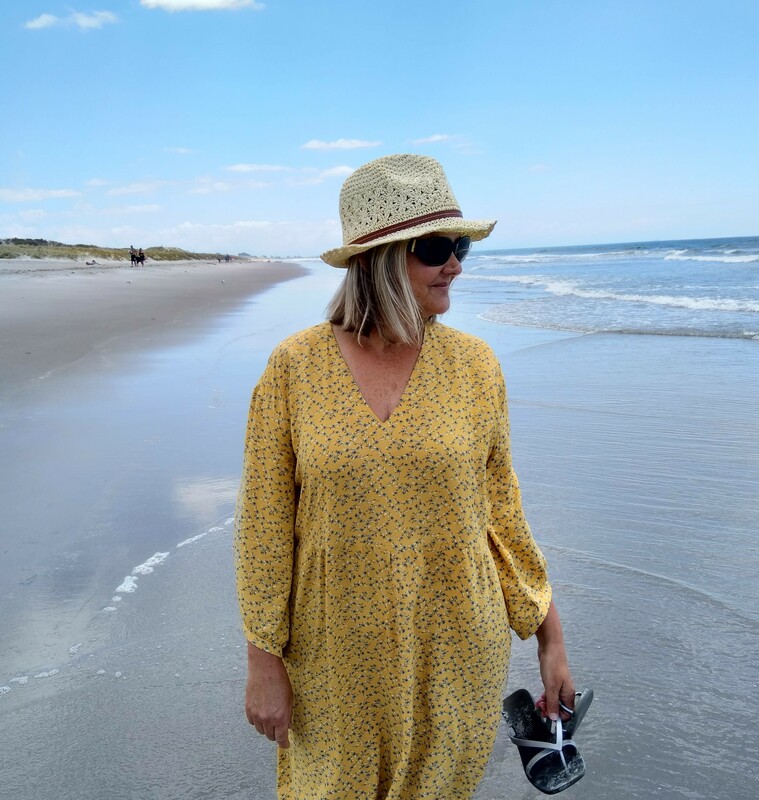 My only slight downfall with this version was not stay stitching or interfacing the neckline – I’d definitely suggest doing so as mine warped out a little during the make. The most time consuming and fiddly part for me was attaching the self made binding to finish the armholes – you could use ready made if you wanted to cut a corner here – but it’s worth it for the lovely finish, inside and out! 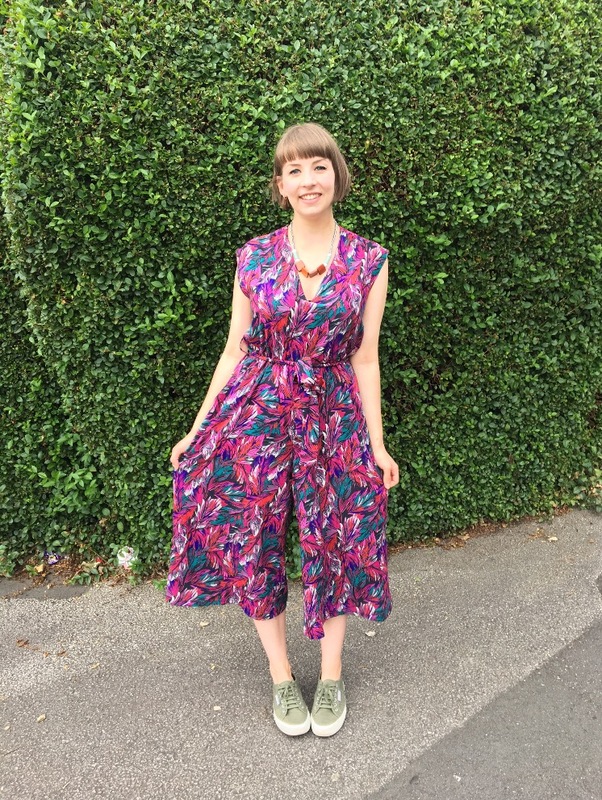 I made the whole Jazz jumpsuit, including cutting and sticking the pattern together, in just one day! I added a tie waist belt and belt loops to my version for a bit of definition at the waist – the fit is very loose/relaxed – and I love the finished garment. I’ve already made a 2nd and I have a 3rd in the pipeline! It’s a pattern I’d definitely recommend!